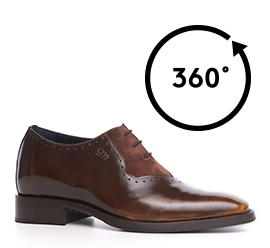 Elegant elevator dress shoe with upper in brown brushed calfskin and sole in real leather sewn at sight. The special craftsmanship of the leather gives unique and original colour reflections. The comfortable inner elevator system can be chosen between 2.4 (6 cm), 2.75 inches (7 cm) and 3.1 inches (8 cm) depending on needs.